This Belleek sugar bowl and cream jug feature green shamrocks on fine china. This Belleek sugar and cream set feature hand painted green shamrocks and measure 3 3/4" tall. The Belleek bowl and jug are made of fine china and are safe to use in the dishwasher and microwave oven. The Belleek cream and sugar set was originally introduced in 1904 and has been reintroduced as a limited edition of 1,000 pieces. 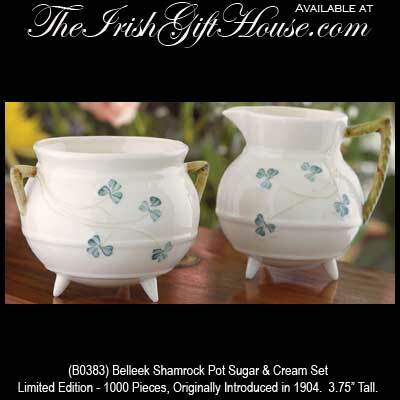 Based on the shape of an old Irish cooking pot, this set was seen for the first time in the 1904 Belleek Catalogue. Popular for many years, it was retired in 1982, eventually making way for a new generation of designs. Brought back as part of the 2009 Archive Collection, the Pot Shamrock Sugar and Cream Set is a lovely addition to any table setting.